A recent report released by the Solar Energy Industries Association and GTM Research shows record growth in the solar industry year-to-year through 2012. With this rising demand for a clean energy workforce, SEI expands professional technical training offerings in 2013. "SEI is, of course, very well respected by Namaste Solar and the rest of the Solar Industry. This is taken into account when reviewing employment applicants' resumes and where they received their training." Solar Energy International (SEI), the nation's leading Solar PV Training organization with the largest alumni association of certified solar professionals, is responding to the recent report released by the Solar Energy Industries Association and GTM Research showing record growth in the solar industry. SEI is responding to this report by expanding their in-person and online solar pv training sessions. These sessions satisfy the prerequisite training to be able to register for hands-on labs and professional certificate program completion. Chris Turek, SEI's Director of Online and Student Services said, "Thousands of people are coming to SEI to get training to enter the clean energy workforce. In response to this large influx of interest, we are excited to announce SEI's 2013 Solar and Renewable Energy Training schedule." SEI is offering Solar Photovoltaic training sessions all through 2013. New for 2013 is an additional special offer of a free textbook / eBook bundle for all students who take the PV101 Online Course. From SEIA's report: "Today the U.S. Solar Energy Industries Association along with GTM Research released the results of its annual year in review, and 2012 numbers give the solar industry another reason to celebrate. In 2012, solar proved once again to be the fastest growing energy source in the U.S. The Solar Market Insight annual addition shows that as a nation, the country installed more than 3.3 GW of solar capacity, an increase of 76 percent over 2011. In terms of market size, at $11.5 billion, the solar market is 34 percent larger than it was in 2011 and SEIA points out that this figure doesn’t include any of the trickle-down industries that also benefit from the increased growth in the solar market. The United States accounted for 11 percent of the growth in the global solar installed capacity in 2012, this is the largest market share that U.S. has taken for at least fifteen years, according to the report. 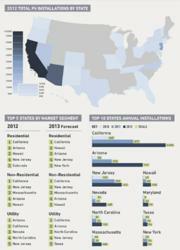 The residential market saw 83,000 installations and eight of the 10 largest PV installations were completed in 2012. In total, the installed PV capacity in the U.S. now stands at 7.2 GW, equivalent to the power capacity of seven nuclear power plants. By the end of 2013, the industry expects that it will top 10 GW." Kathy Swartz, Interim Executive Director for Solar Energy International said, "This report is definitely in line with the steady increase of student registrations and inquiries about our solar PV and other renewable energy training opportunities. We have hundreds of students travel to our world-class Solar Photovoltaic (PV) lab facility in Paonia, Colorado every year. The interest continues to increase every year and we needed to find a way to offer flexible educational opportunities that would allow our students to get their prerequisite course work completed so they could come to the week long hands-on labs in the summer. The SEI Online Campus has made this training a reality for thousands of people from all over the world while maintaining SEI's rigorous quality standards of teaching and learning." Another recent report from The Solar Foundation and the third annual National Solar Jobs Census report found that the U.S. solar industry currently employs 119,016 Americans. This figure represents the addition of 13,872 new solar workers and a 13.2 percent employment growth rate over the past 12 months. According to the Bureau of Labor Statistics, employment in the overall economy grew at a rate of 2.3 percent during the same period, signifying that 1 in 230 jobs created nationally over the last year were created in the solar industry. The report, produced by The Solar Foundation and in partnership with BW Research and Cornell University, was released at the Interstate Renewable Energy Council's Clean Energy Workforce Education Conference in Albany, NY. When asked about the quality of graduate from SEI's Solar Professionals Certificate Program, Blake Jones, SEI Alumni and CEO of Namaste Solar said, "SEI is, of course, very well respected by Namaste Solar and the rest of the Solar Industry. This is taken into account when reviewing employment applicants' resumes and where they received their training. Establishment of the SEI Solar Professionals Certificate Program will help formalize proof of a rigorous training program completion and make it easier to distinguish training certificate holders from other employment applicants." Solar Energy International (SEI) was founded in 1991 as a nonprofit educational organization to help others to use renewable energy resources and sustainable building technologies through education and technical assistance. Our vision is focused on helping create a more sustainable future for our planet and its inhabitants. Through our work, we see clear opportunities to influence people's thinking and behaviors towards energy efficiency and the use of natural, sustainable methods of energy production and utilization. Solar Energy International is a 501(c)(3) Equal Opportunity Institution and Employer, and is not affiliated with any dealer, manufacturer, distributor, or any other renewable energy commercial enterprise.